The architects were awarded the Silver A'Design Award for their 3,750-square-metre arts centre, which is made up of ten separate spaces housed within irregularly-cut, stone-clad volumes. 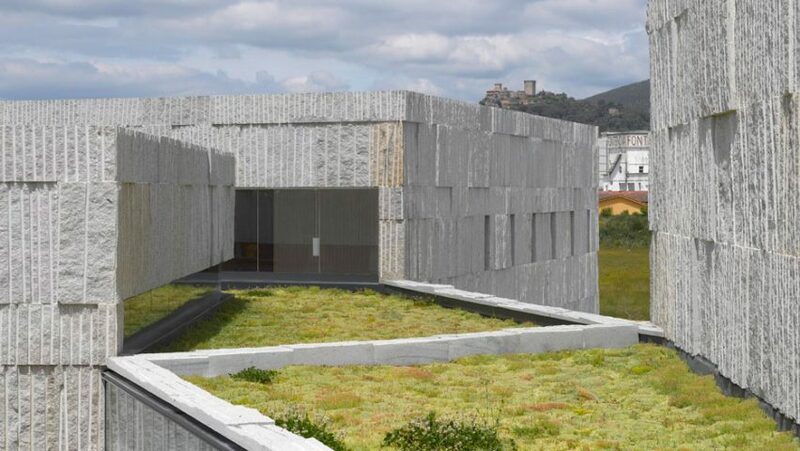 However, by using locally-sourced granite quarried from Pontevedra province for the centre's facades and floors, the studio achieved a sense of continuity between the blocks. Zooco Estudio wanted the centre to serve as a "space of coexistence and relationship without hierarchies" to support the idea of living within a community. "The arts centre of Verín provides the intimacy of a home and the heterogeneity of a town," said the studio. "The displacement and delicate turn of volumes generates a random appearance scheme but full of relationships and variants," it added. "It is a place defined by its own flexibility, unpredictable." "The project considers the environment and works by following the scheme of urbanism of the city of Verín," said the architects. "Like a small town centre, users interpret and live in spaces freely and at will. They walk from one side to another, seeking privacy behind a corner or leave, to see and relate."